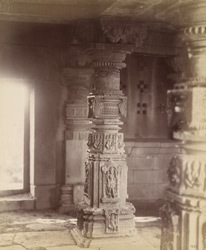 Photograph of a column in the Lakshmi Narayana Temple at Pedgaon, taken by Henry Cousens in the 1880s. In the Bombay List of 1897 Cousens wrote, "...there still remain, within the precinct of the fort, the ruin of five Hemadpanti temples, one of which, that of Lakshmi-Narayana, is a perfect little gem. It is most profusely decorated both within and without, and its outer walls are thickly covered with figure sculpture...It is a Vaishnava temple facing west, built on a high part of the bank overlooking the river, and whose spire, now absent, was, like many of this class, probably constructed in brick work. The basement mouldings are studded with little figures of horses, elephants...The walls above the basement, the pillars, and the door frames are richly wrought, the pillars being of rather a different type from those generally met with."